New. Glued binding. 560 p. Kinsey Millhone Novel, 25. New. 6 CDs. Kinsey Millhone Novel. New. Trade paperback (US). Glued binding. 496 p. Kinsey Millhone Novel, 25. New. Trade paperback (US). Glued binding. Kinsey Millhone Mystery. New. Sewn binding. Cloth over boards. 496 p. Kinsey Millhone Novel, 25. New. Sewn binding. Cloth over boards. Kinsey Millhone Mystery. The author has done it again with another excellent story...It begins in 1979, when four teenage boys from an elite private school sexually assault a fourteen-year-old classmate - and film the attack. Not long after, the tape goes missing and the suspected thief, a fellow classmate, is murdered. In the investigation that follows, one boy turns in evidence for the state and two of his peers are convicted. But the ringleader escapes without a trace. Now, it's 1989 and one of the perpetrators, Fritz McCabe, has been released from prison. Moody, unrepentant, and angry, he is a virtual prisoner of his ever-watchful parents - until a copy of the missing tape arrives with a ransom demand. That's when the McCabes call Kinsey for help. As she is drawn into their family drama, she keeps a watchful eye on Fritz. But he's not the only one being haunted by the past. A vicious sociopath with a grudge against Kinsey may be leaving traces of himself for her to find. 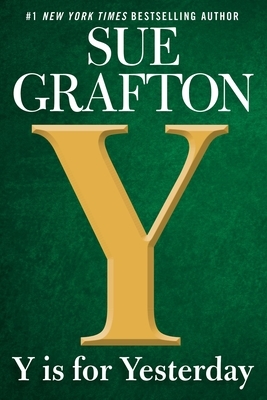 Sad as it may seem there will be no Z to finish the alphabet, because after "Y is for Yesterday," Sue Grafton died at age 77 after her long battle with cancer. She will be sorely missed. I loved all her mysteries from A-Y as well as her short stories entitled, "Kinsey and Me." She was an awesome writer. I have come to love her books, and miss her very much.